So, I've never been a Boy Scout or Cub Scout. I didn't even know there was anything younger than a Cub Scout. Isaiah told me he was in "scouts" but couldn't remember exactly what they were called. I asked Amy. Then, I promptly forgot what she said. I told Ron that Isaiah was in "scouts." He said, "What is he?" I said I didn't know but I thought he was a squirrel or some other little animal. Well, needless to say, I was wrong. But - Ron couldn't remember anything younger than a Cub, either. AND HE WAS A SCOUT. So - I don't feel too badly on that. 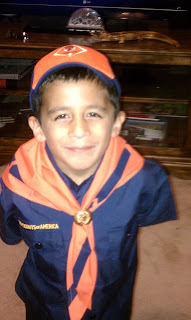 But, isn't our little guy just the cutest thing in a "Tiger" Scout uniform? Isaiah has been going to the YMCA all summer and they have spent a lot of time at the pool, but he hasn't really done anything that involved putting his head under water for any length of time or required him to hold his breath. He worked really hard with his new dad this past week to learn how to swim. He did a great job! He did such a good job, that when we went out on a catamaran tour and snorkeling trip, he was confident enough to get out in the ocean and snorkel. He was looking like a pro out there!